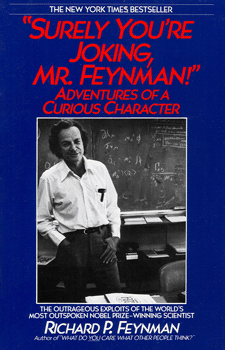 Surely You’re Joking Mr. Feynman: Adventures of a Curious Character. Cover. I just finished reading a book that resonated as a real behind the scenes look at the life of Nobel prize winner Richard Feynman. Biographies are good for getting a feel of the context around great minds. Autobiographies can be especially revealing. Surely You’re Joking Mr. Feynman gives us something better.. insight to the mind behind the practical jokes, travels, and stories lived by Mr. Feynman. I saw myself in many of the Feynman’s stories. Seems like a good friend telling me how absurd it an be to go through the silliness surrounding being a Nobel Prize winner as if it’s a casual event as getting stuck on a mindless committee. A Television interview can be a pain to deal with, as can a party. Perhaps my favorite chapter is the story where Feynman takes a speaking assignment only upon the condition that he did not have to sign his name more than 13 times to do. Some of the stories are dated. That adds to the charm. Richard Feynman lived in a time when most of the technology we take for granted wasn’t around, but close enough to out time to feel quite real, as if I could remember it if I just reached out a bit. The world is absurd. Thanks for the reminder. Many good laughs. Ideas generated and a wonderful read.